Core strength is a current buzz phrase in fitness and riding. Students tell me “if only I was stronger in my core I could …. (fill in the blank)….” It’s as if your “core” will answer all your riding problems, overcome lack of fitness and create that perfect flat stomach which many Americans desire. However, in my experience, rider’s who overly focus on core strength miss the larger and more important picture. To simplify I will divide core development into two groups “good” and “bad”. 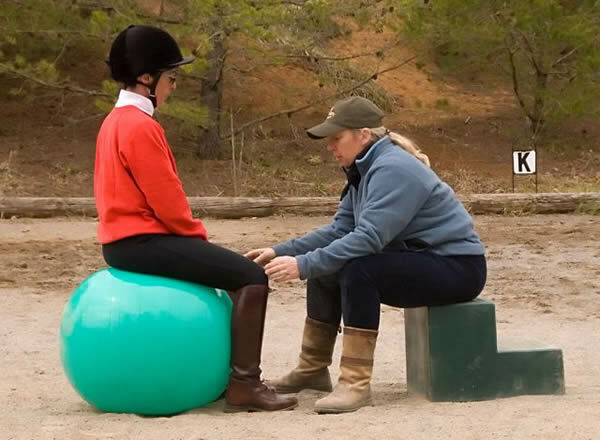 I have seen “strengthening the core” as helpful to some riders and a major cause of problems in others resulting in loss of function, back pain, decreased hip mobility and severe hip pain. It is the latter to which I am referring as harmful to overall fitness and riding. Good development results in greater overall fitness without loss of function. Bad core development is when muscles are intentionally held in contraction regardless of what movement the person is doing. Bad core development has nothing to do with the function of riding. While intentional muscular contraction may allow the student to do specific gym exercises, intentionally maintaining muscular contraction for long periods is not relevant to riding and everyday life. 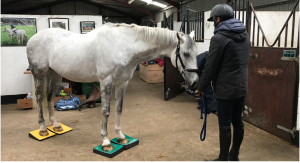 The problem with the idea of core strength for riding is that the intended purpose is to maintain correct alignment of the spine and pelvis, which is assessed in a static position. Strength is measured by how long someone can hold a plank position (the plank is performed by lying flat on the ground and then bringing yourself up on your toes and forearms). The objective of this exercise is to hold the position without movement for as long as possible without loss of form. The problem with this as a test is that it has no place in riding. Riding is dynamic! Therefore overdevelopment of core strength limits the motion in the pelvis, hips and spine required for riding. Yes, developing your core will give you a flatter stomach but is this valuable or simply esthetics? Between your abdominal wall and spine are your internal organs, particularly the intestines. The intestines are a stretchy fluid filled tube that expands depending on how much food you have eaten. Young children who have just learned to walk have a round potbelly. They have lovely posture (unless there is a serious problem such as congenital scoliosis) in spite of this apparent lack of abdominal strength. The postural muscles unconsciously support the spine and head without limiting function in the pelvis and hips. If you watch them play in the sand they can squat for hours without discomfort. Young children are able to ride and have lovely posture on horseback. So why do we think that we need 6-pack abs to have spinal stability? Obviously women who have had surgery like a “C” section require a certain amount of targeted abdominal strengthening exercises to bring their abdominal mm strength back to their pre-C section strength. Overdevelopment or intentional contraction of rectus abdominis (the 6-pack muscle) by holding your belly button in is unnecessary for good posture. Instead holding this area limits function because rectus attaches to the pubic arch at the bottom and the xyphoid process (bottom of the sternum) at the other. Contraction of this muscle restricts breathing and restricts the pelvis and hips, which are so important for good riding.We recognize that we don’t want the horse to brace so why ride bracing the abdominal muscles? Yes there is a time to use them but not all the time! To feel how intentionally contracting the abdominal muscles affects overall function, do the following. Begin by noticing your breathing, the quantity, and ease and where your body is moving as you breathe and then tighten your core – what happens? Notice how shallow your breathing becomes. Feel how the lower ribs are restricted. Let your belly go soft. How deep can you breathe now? Contract your core muscles and feel what happens in your waist area between your rib cage and your pelvis. Bend to the side and notice how much effort it takes. Let your abdomen relax and side bend again. How is it now? When you let the appropriate muscles do the job you can do more with less effort. Stand up and pull your belly button toward your spine. Slowly lift one knee toward your chest while keeping your abdomen pulled in. How easy is it to lift your knee? Let your belly go soft and repeat lifting the leg. How easy is it now? Feel how holding your core limits the movement in your hip joints, pelvis and restricts the amount you can lift your leg easily. I am sure if you wanted you could pull your leg up with your core tight but how much more effort is that? Good riding requires your pelvis to move with your horse. Your spine needs to be able to move so that you can absorb the horse’s back motion. Maintaining an alignment required to hold a plank is not going to absorb motion since the pelvis and lower back are no longer pliable enough to follow the motion. Therefore core strength is counterproductive to good riding. Core stability is a more appropriate goal because it includes coordinated movement of the spinal column. Unfortunately this concept has been greatly overshadowed by the prominence physical fitness that promotes core strength. 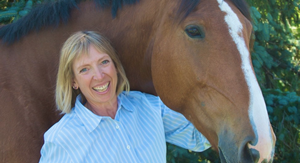 From my perspective as a riding instructor and Feldenkrais Pracitioner®,function is the most critical element as to whether an exercise is useful or not. Strength is not useful if your muscles are strictly conditioned to weight machines, gym exercises, end-range movements, and artificial control of muscles. Bodies trained in this way lose functional variety because muscle memory strengthening is very activity specific and does not carry over much to other activities. These types of exercises do not develop the fine motor control required in riding. A rider that trains herself to constantly hold the abdominal muscles will not be capable of riding well due the limiting effect this constant contraction has on the ribcage and hips. Efficient movement requires that muscles contract, de-contract and semi-contract at the right time in the right amount to produce a coordinated smooth and fluid motion. The appropriate muscles need to fire and stop firing unconsciously to be supple and strong. This is critical for good riding. If you hold excessive muscle tension for the sake of holding and ignore function then you will be out of time and sync with the horse. You will never achieve the elegant movements required to ride in harmony or unity that you desire. Therefore striving for core stability, which includes diversity, variety and uses the entire body is what we need to focus on for riding.Exercises such as hula hooping, dance, swimming, walking use the entire body and distributes the effort through the whole body. I practice learning new movements by doing Feldenkrais Awareness Through Movement® lessons so that I am able to function more efficiently with less effort. Each time I learn a new movement it makes my overall use better, more efficient. This also allows my horse to use himself more efficiently with less tension. In closing, if you get a chance, watch small children ride. They can control a horse that far outweighs them. If “core strength” is so important how is it that they can ride so beautifully? Yes you need to have good muscle tone and it is important to keep that up as you age. How efficiently and easily you use yourself far outweighs how many pounds you can press or how long you can maintain the plank. Take up activities that require functional overall movements such as dance, swimming or walking or Feldenkrais Awareness Through Movement lessons and always remember to enjoy the ride! 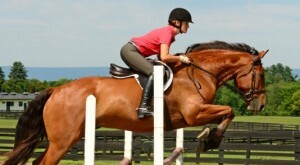 Wendy is available for lessons and clinics in her home state of Virginia as well as other locations throughout the US. For her 2011 clinic schedule and other free articles or to order and autographed copy of her latest book, 50 Five Minute Fixes to Improve Your Riding please go to www.murdochmethod.com. 2Panjabi, M., The Stabilizing System Of The Spine. Part 1 and Part2. Journal of Spinal Disorders 5(4): 1992 pp. 383-397. 3Nadler, S. F., G. A. Malanga, L. A. Bartoli, J. H. Feinberg, M. Prybicien, And M. Deprince. Hip Muscle Imbalance And Low Back Pain In Athletes: Influence Of Core strengthening. Med. Sci. Sports Exerc., Vol. 34, No. 1, 2002, pp. 9-16. 4Tse, Michael A.; Mcmanus, Alison M.; Masters, Richard S.W. Development and Validation of A Core Endurance Intervention Program: Implications for Performance in College-Age Rowers, J of Strength & Condtioning Res. 19(3):, Aug 2005. pp. 547-552.